For decades I've been obsessed with reference books (such much so that I've written a couple myself). It started when I was a little kid and would pore over the Guiness Book of World Records. I would sit with that book for hours, utterly transfixed by such phenomena as the world's tallest man, the world's longest fingernails, the world's heaviest twins, and the woman with the world's thinnest waist. In the years since, I've read a variety of reference books to tatters, including The Book of Lists (all three volumes), the Big Secrets series by William Poundstone, the Imponderables books by David Feldman, the Why Things Are books by Joel Achenbach, Isaac Asimov's Book of Facts, The Slings & Arrows Comic Guide (a British publication with thousands of comic book series reviews), The 100: A Ranking of the Most Influential Persons in History by Michael Hart, and countless others. 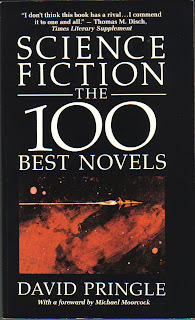 Today I was reading David Pringle's Science Fiction: The 100 Best Novels, and there on the first page of the first entry, I read what is now my favorite quote. In the piece on George Orwell's 1984 (one of my favorite all-time books), Pringle quotes a line from an Orwell essay called "Wells, Hitler, and the World State." In writing about H.G. Wells (one of my favorite authors), Orwell (also one of my favorite authors) wrote: "It was a wonderful thing to discover H.G. Wells. There you were, in a world of pedants, clergymen and golfers...and here was this wonderful man who could tell you about the inhabitants of the planets and the bottom of the sea, and who knew that the future was not going to be what respectable people imagined." Now, I've got nothing against clergymen or golfers (or pedants for that matter), but I love that quote. Not only is it cool to contemplate Orwell discovering Wells, it artfully, cogently, and concisely illustrates Orwell's preference for the outré (or at least the fantastic) over the mundane (or at least the commonplace), and that there are others out there of like mind.